In 1953, Joe Keeling was a traveling salesman covering all of Arkansas for Lewis Diesel Engine Company in North Little Rock, Arkansas. They were a Detroit Diesel Engine distributor who sold power units for everything from running sawmills to re-powering trucks. During the years 1953-1955, there was a serious drought in Arkansas. So as an avenue to sell more engines, Joe and the North Little Rock branch of Lewis Diesel Engine began to furnish engine and pump combinations to an agricultural market that was desperate for water and the new irrigation method which used aluminum pipe and sprinklers. Late in ’63 and ’64 Lewis Diesel Engine Company changed ownership and sold to RCH Distributing of Memphis, Tennessee. In 1965, RCH decided to sell its North Little Rock store and move. As part of a deal struck with RCH, Joe Keeling received a security safe and a 1963 Chevrolet two-ton truck. The first location was a converted tomato shed in Little Rock, located where the Little Rock Airport now meets Roosevelt Road. We were there until 1968 when we purchased the property where our current headquarters and main branch is located to this day. Our two initial employees besides Joe Keeling and his wife, Helen, were John Schneider and Billie James. 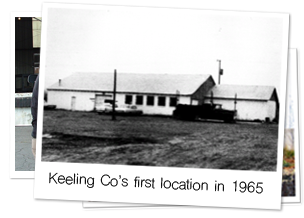 Both John and Billie have since retired from their careers with Keeling Company. We began as a distributor for the agricultural market and while we have moved on to serve additional markets, many of the products we distribute still have their roots in the agricultural markets. At the time though, irrigation was only really used in agricultural settings. However, in 1967, Keeling Company demonstrated serious growth in both service and diversity as Joe Keeling and Ed Shoemaker furnished one of the first 18 hole golf course irrigation systems in Hot Springs, AR at Belvedere Country Club. We are very proud to own all of our branches. We feel ownership makes a statement to our employees and customers. We are here to stay, through good times or bad—not just until the lease expires. We are very proud of our loyal, enthusiastic and knowledgeable employees who work with us. We are also very proud of our diverse customer base, many with whom we have enjoyed doing business since Keeling Company began. Keeling Company’s philosophy is that the customer is the one we strive to satisfy. The customer is the foundation of our business.